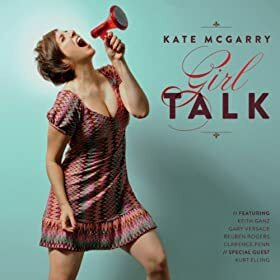 I was only recently exposed to the amazingly comfortable vocal style that Kate has… as soon as I listened through the first few bars, I knew we needed to get a few words from her on her perspectives about her music, life & the living of it! As always, we are appreciative of artists who take time from their busy schedule to give us some insights to what makes them tick… without further ado, then, here are my questions & Kate’s answers – enJOY! Zzaj: Please tell my readers (& me, of course) how you manage to get from Massachusetts to African American musical degrees… my mom’s side hailed from Vermont, & that would have been a bridge too far for them… in other words, give us some spontaneous bio that tells how you got from a family of 10 to the top (in my view, anyway) of the female jazz vocal genre. KM: I knew I wanted to study jazz from the time I was in high school but my family couldn’t afford Berkley. Luckily UMass sent a trio to my school to talk to prospective students about their Jazz program which was called Afro American Music & Jazz. It didn’t seem strange to me at all – They had me at “Hello”. Zzaj: Having grown up in a musically (very) active family (oh, so many years ago), I can relate to those “many nights singing” that one of your bios mentioned… how (do you think) have those early vocal experiences influenced the music you sing today? KM: My parents sang all the time – just for their own enjoyment and to make each day more pleasant. Also as a way to worship and pray and connect with each other. Singing wasn’t for getting attention so much as keeping the family close. I feel the same way now. A good show is one where everyone in the room feels closer to themselves and each other when they leave. Zzaj: I hear shades of jazz singers all the way from Joni Mitchell to Aretha Franklin… all of us (I believe) tend to “incorporate” those players/singers we love the most, but you still come across as “purely McGarry”… tell us how you do that, please. KM: I am not sure except that I have very strong feelings about whatever I am singing. I think this keeps me connected to myself which is going to naturally sound different from anyone else. Zzaj: Please give us a few words about your collaborations… one I was most interested in was your Arts For Life CD “My Life Is Bold”… how much time are you able to spare for such projects? What spurred you to get involved in that one (or any others you want to discuss)? What are the rewards of such? KM: Becca Steven’s whose father is on the board of Art’s For Life asked me to write a song to go with one of the kid’s poems and I was happy to do it. Collaboration is a great way to keep growing because you can’t control everything and it helps you be open to making music with whatever is given to you. Zzaj: Ah – why “jazz”? With your broad range of styles, I can see you fitting right in with soulsters like Aretha or Patti LaBelle… what’s the main attraction in jazz vocal work for you? Is it the freedom, or something that’s just naturally your style? KM: When I was growing up I often remember remember feeling overwhelmed by the chaos and intensity inherent in a large family (12 of us including my parents) Jazz seemed like the only music that had enough range and nuance to express any emotion I was feeling – I gravitated to it very naturally. Also, I hate following directions …so jazz is perfect for me. Zzaj: I see a lot of work you’ve done with jazz players, but your bios didn’t say too much about performance with other vocalists? Do you work with other singers, & if so, who? KM: yes – I’ve had the good fortune to work with some singers I admire greatly. Kurt Elling on Fred Hersch’s Leaves Of Grass CD and then a few years later – MOSS which is a group that involved Luciana Souza, Peter Eldridge, Lauren Kinhan and Theo Bleckmann. Our debut recording MOSS is one of my favorites. I love that band so much. Kurt also did a duet with me on Girl Talk – that was fun – he is just amazing…what a gorgeous voice. Zzaj: Is/was there any particular vocalist (male or female) that you studied when you were just beginning? It seems that you’ve made a lot of different vocal styles “your own”… do you have favorite styles, or is it the energy of a particular genre/form that attracts you to it? Kate: from the jazz genre Carmen McRae is one of the people I listened to very closely. also Jon Hendricks, Betty Carter, and Shirley Horn… In the folk songwriter tradition James Taylor, Joni Mitchell and Rickie Lee Jones.., from the funk and R & B tradition, Chaka Khan…I love lots of traditions and was influenced by all of them. Zzaj: Are stage performances more preferable than studio recording for you? Which kind of performance do you feel yourself drawing more energy from? Is that just another “ridiminous” interviewer question (do you think)? Kate: I like both – studio and live performing. They are very different lands and both have their pros -and cons; that said I like them both equally. Zzaj: What’s the next big project (show, recording, collaboration or elsewise) you’re working on? Why is it important to you right now? Give us a little insight into what it’s all about, please. Kate: I have a few projects on deck…the first is a duo project with Keith (my husband/guitarist) for a european label that only wants to put out vinyl. The other project is that I would like to record a live album – I hope to do this somewhere in NYC over the fall or winter. Zzaj: Is your voice your only instrument, or have/do you play others? If it’s only voice, tell us a bit about how you get the most out of it… if it’s other instruments, tell us (then) why you focus on vocal work, please. Kate: I have always played just enough piano to write arrangements on and investigate chords with. Maybe someday I’ll feel comfortable enough to perform a song while I play the piano. I also play a sruti box – a droning instrument… even your cat could play that. i focus on vocal work because it is the most satisfying to me and it seems to be what I am best at. You can get lots more information on Kate and her wonderful music at HER SITE (be sure & tell her Zzaj sent you)!